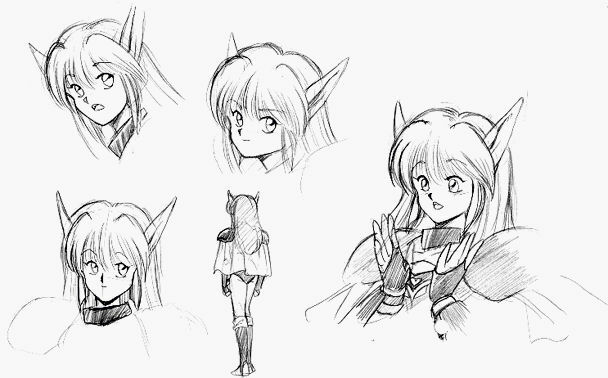 This is another look at Rika in her early development stages, during the time she was called Nei by the game staff. She is not very different from the final character. These expressions show that same sense of wonder and surprise that made Rika such an unique character in the game. It is hard to imagine the game without Rika. I am glad Yoshida stuck with the character and made the minor changes needed to get the rest of the staff to accept her. You may view the gallery page for Nei Mark 2, part 2. Sweet picture and yeah, the expressions and poses are indeed very much Rika's. I sometimes wonder if Yoshida added "Nei" to PS4 as some sort of redemption...in a way giving a character whom fate treated very harshly in PS2 a second chance at experiencing life and love...complete with a human life span and a hug from Chaz at the end. Given the translation of Memorial Drama CD I've seen online somewhere, I wonder about that also Erpy. I don't know offhand if Yoshida was involved with the Memorial Drama, but the revelations about Nei and Rika in that really support the idea. Have you seen Rebecca Capowski's translation of the PS Compendium and PSIV staff interview? It pretty much bears out what you're both suggesting about Rika (a.k.a. Fal) being a happier incarnation of Nei. Quote: Q: Back to Millennium - is it true that Fal was developed from the original Nei? Yoshida: Well, I was thinking about using the first Nei [in Millennium], but the other staff members had a lot of things to say about that. They still do, in fact. Nishiyama: I thought that if she just had the long ears it would've been fine. Tsugawa: I said it would've been all right to leave their [Fal and Nei's] ears the same. Q: Was there any reason? Yoshida: It was probably a “why now?” kind of thing. Because, at that point, it had been three years since [Phantasy Star] II came out. I actually use the translation as source for these descriptions. Most of these Saturn collection pictures are also in the Compendium, so I look up the descriptions if there are any. It's been ages since I read the staff interview section, though. Several very flattering looks at Rika! I love the one on the end with her hands showing! Fantastic!! Great pictures here ! Tre that the last one with tha hands sort of applausing is the greatest one ! Good job !